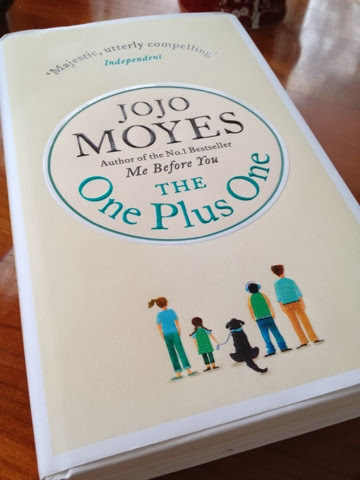 JoJo Moyes has a writing style which is so down to earth, so in touch with her endearing characters, that it makes me embrace all that is imperfect in this world. Suddenly, the flaws which offend me about me about myself dwindle down to size, and I am able to smile at how often one’s dreams are thwarted. Jess is the glittery nail polished, flip-flop wearing heroine of the novel, who cleans houses, works in a bar, and cares for her two children. One is a stepson who keeps getting beaten up, and copes with life by hiding away with his stash. The other is a girl whose passion and strength is Math. It also resides with Norman, the huge, black family dog. When these four are found next to the broken down Rolls that Jess’ husband left her, the adventure begins. They had been on their way to a Maths Olympiad, in the hopes that the little girl could win such a competition and gain the money required for acceptance into the private school, St. Anne’s. But, as strong as Jess’ determination was, it wasn’t strong enough to carry them from London to Scotland in a broken down car with no insurance. Fortunately, Ed Nicholls, a client of Jess’ found them. He volunteers to drive the whole group in his immaculate car, and before long a hilarious and grievous debacle begins. The dog, Norman, drools all over the leather seats which have chocolate buttons now melted into the crevices; sweaters and books are cast about; real life has entered in to Ed’s luxurious, but crumbling, life. Of course, it’s clear that the Ed and Jess will fall in love. That their strengths and weaknesses compliment one another. But, a wedge comes between them which could effectively divide them forever. In The One Plus One JoJo Moyes writes of our imperfections, the ultimate kindness of strangers, unlikely heroes, and most of all, hope. For, as Jess says, “Good things do happen.” It’s just up to us to believe that they do. This sounds like a perfect cheer-me-up book – and good things *do* happen, of course! I really need to find the time to read this. I have loved the other books I have read by her, especially the later books that she has released. I love this author and I'll be the first in line to purchase this new release as soon as it hits the shelves. Great review, Bellezza! This sounds wonderful! After two novels and a novella, I'm a big fan. Can't wait to read Moyes' latest. I really need to find time to read Jojo Moyes! I say that all the time and it still hasn't happened! I hadn't even heard of this one, but she sure has talent. Sounds good. I have to try her work. This sounds delightful! I didn't know she had a book by this title too. I will have to check it out.